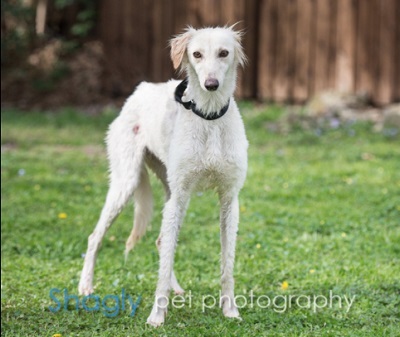 Vixey is an approximately 2.5 year old white & fawn female found as a stray at the intersection of Highways 287 and 360 in the Mansfield, TX area. She along with the other three found together make up the Mansfield Four. Tod, Zelda, Vixey and Squeaks were rescued by The Forgotten Ones Rescue and transferred to GALT immediately. 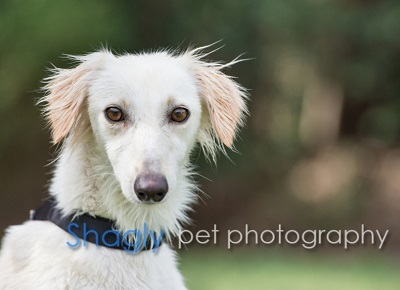 Vixey's DNA panel shows that she is a Greyhound, Saluki, Borzoi, Italian Greyhound mix - whew! Vixey is considered to be cat tolerant." Vixey is a petite, fluffy bunny-furred white shadow who will follow you around the house day and night. She is both people and dog oriented and wants to be involved in everything happening in the household. Her house manners are impeccable, though she has just learned from her foster brother to put her paws on the kitchen counter, so counter surfing is a potential with this little girl. She loves stuffies, playing with socks, tummy and ear rubs, and her tail may be one of the happiest you've ever seen. She alternates between being terrified of the family cat, to being curious about what he is, though she mostly ignores him and is easily corrected if she looks at him for more than a few seconds. She sleeps well through the night, goes outside and does her business and wants back inside immediately, and eats well. She does need another dog for companionship and some canine play time, as well as a six foot fence. Put some fluff into your life - choose Vixey!